The derailments spill a significant amount of crude, which underscores a lesser-known danger of America’s oil boom. BILLINGS, Mont. 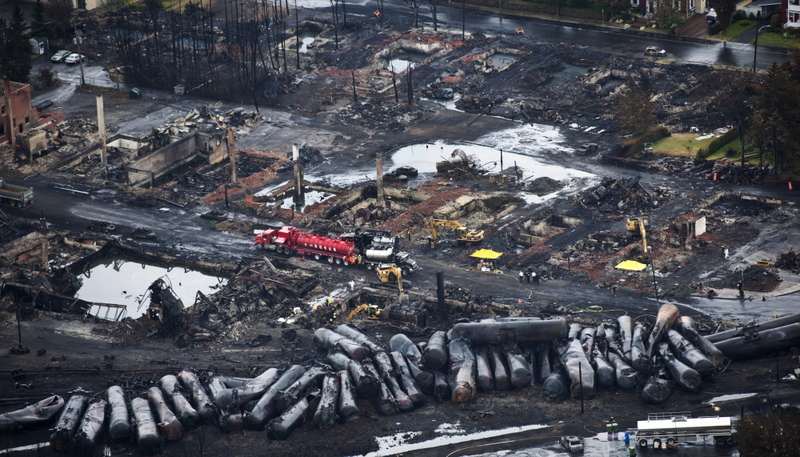 — At least 10 times since 2008, freight trains hauling oil across North America have derailed and spilled significant quantities of crude, with most of the accidents touching off fires or catastrophic explosions. 2013 Associated Press File Photo Workers comb through debris after an oil train derailed and exploded in the town of Lac-Megantic, Quebec, last July, killing 47 people. More trains are being used to ship oil, and they travel through populated areas. Experts say recent efforts to improve the safety of oil shipments belie an unsettling fact: With increasing volumes of crude now moving by rail, it’s become impossible to send oil-hauling trains to refineries without passing major population centers, where more lives and property are at risk. “I don’t think people understood the potential for a problem if there were a derailment,” said Jason Kuehn, a former railroad executive and now vice president for the industry consulting firm Oliver Wyman. Proposals to route trains away from population centers are modeled on rules adopted after the 2001 terrorist attacks to restrict cargoes even more hazardous than oil — explosives, radioactive material and poisonous gases.